LaserBlack enhancer: make negative from your printer make your own negative and washout by water are major merits. @StampBag easy to fill in photopolymer as a ready made sachet only these two new inventions can make stamps economically. 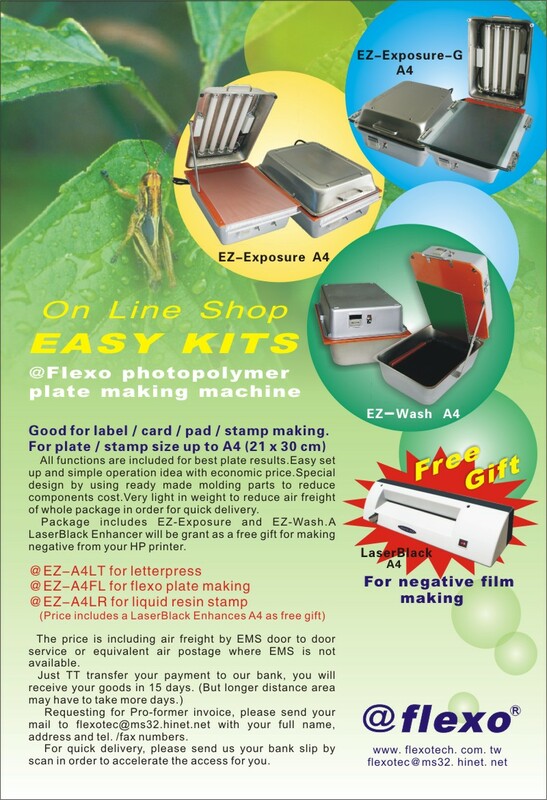 Water wash and easy for one who wants to start stamp making Economic x simple x quick process x green x environ-friendly. Please ask for total C&F delivery to you ! @StampBag is a completely new development for stamp making from an office stamp to mass production of fancy stamps. This innovation is experienced from 30 years of conventional liquid & solid photopolymer stamp making. LaserBlack Enhancer to make negative from your laser printer, which is a perfect solution for water washout stamp making. Please visit www.laserblack.net for more information. Water wash-out is the best advantage of @StampBag System, no solvent means less drying time, quick ready as well as saving cost for plate making and environmental green. Water washout time is only 2 minutes. In less than 20 minutes, you can have a stamp made from your monitor including print out, LaserBlack enhancing as a negative film on tracing paper and stamp making by water wash. Remember that cost of tracing paper is as low as nothing . For more details please visit www.stampbag.net. @flexo group is announcing new product of F-90 liquid photo resin which is for casting industry and rubber stamp / plate making by using matrix. Low cost, water wash, easy operation and economic equipment investment are the merit. 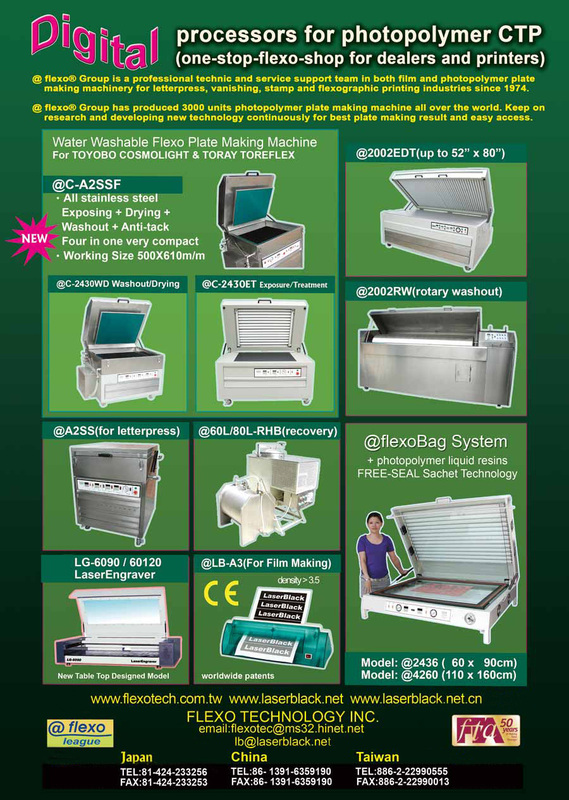 By only preparing a tank of F-90, you can make hardness of 90 A (32 D) and heat resistance of 150 degree C to make any size mold or matrix you like. Solid plate for matrix is getting less and less therefore the cost of it is higher and higher, by using liquid resin the cost is only 50% of a solid photopolymer plate. Due to new inventions / patents, from LaserBlack now you can have negative to make a plate quickly also due to @flexoBag liquid photo resin now is very easy to make a plate for molding or matrix. LaserBlack enhancer can make a negative by your own HP laser printer print on tracing paper or transparent film, go through our Enhancer after drying it you will have a negative on hand in your plant for plate exposure. By a concept of putting resin into a bag to pre-treat the bubbles, @flexoBag is a total new solution for you to make a plate from photo resin quickly and easy. 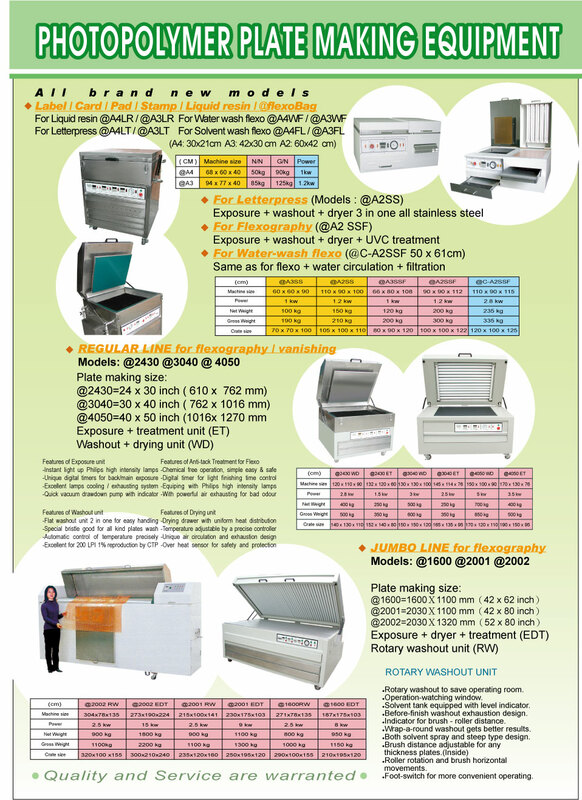 The equipment is available from A4 size to A0 as any size as you wish. bags. We offer superior performance to meet thedemanding quality for contemporary packing print industry. ※	Uniform thickness and proper hardness to ensure good printing quality. ※	Sharp relief shoulder, clear & fine graphics capability especially suitable for the oriental fine characters. ※	Short exposure and fast wash-out to enhance productivity. ※	Excellent Flexo ink transfer, Excellent Flexo ink coverage. ※	Good clarity for easy registration. ※	Back-exposure : The length of back-exposure sets the relief depth :this exposure provides the proper base to anchor the finest relief image. ※	Main-exposure : After removal of the protective film, this exposure through a negative film to form the printing relief. Use a matte negative. ※	Wash-out : The photopolymer in the non-imaged area washed away. The wash-out solvents normally used for flexo-plates. Including those environmentally-save ones. Are suitable. ※	Drying : The wash-out solvent retaining in the plate evaporates during this heat drying process. After drying allow the plate to rest for a period of 12 hours to return to the original caliper. ※	Post-curing : Exposure the polymer plate again to increase hardness & physical strength. ※	De-tack : This may be done by exposing the plate face to UVC light. By using a injection set or any plastic bottle with a taper mouth by putting resin into the injection set / bottle, bubbles will happen, stand the bag in a carton paper box over night (as the photo shown) or at east for 1 hour, in order to let all the bubbles go to top then eventually break and disappear. The cost of this @StampBag is only 30% of a sealed pack. become a middle bubble then middle bubble become a big bubble, at last big bubble breaks and disappears. of the stamp surface and the thickness of the stamp. The glass frame is special designed and made by 2pieces of glass with a fix gauge for the fixed thickness of a stamp. (normally 3.00mm) once the bag with negative are put in, close the cover glass, it will squeegee the resin inside the bag, more pressure will squeegee the excess resin out and resin in the bag becoming saturated. @StampBag the exposure time is only 40 seconds.